The Gundersen House is located in Haugesund, Norway on Scandinavia’s most western point. Designed by WRB Architects, the modern home sits on the shore of a fjord overlooking the water. 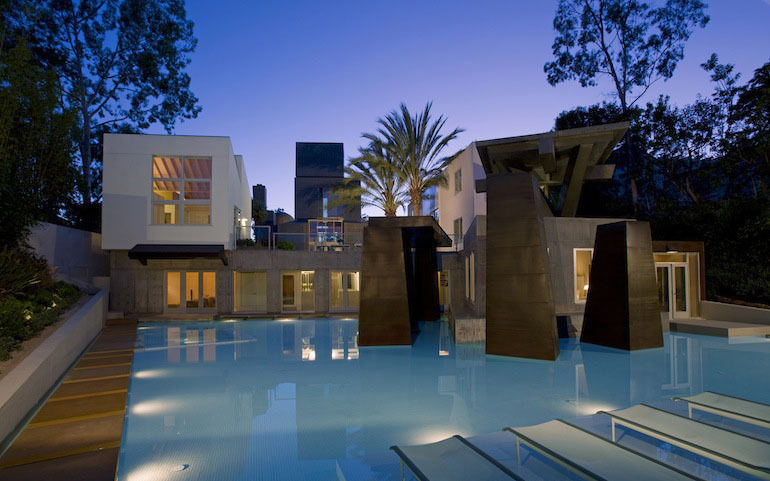 The heart of the home is the outdoor fireplace under the roof covered patio and the heated swimming pool. The open plan house design and large patio take full advantage of the stunning waterfront setting. The “Auto Residence” house located in Gnigi near Salzburg, Austria is a Volkswagen Beetle inspired home designed by Master Builder Markus Voglreiter. The owners bought the original 70’s style house and wanted to renovate and update the structure. 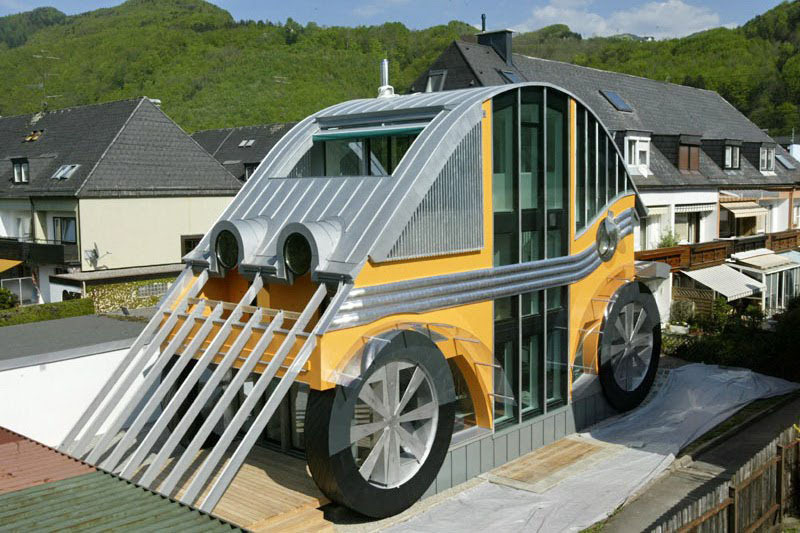 The result was this unique transformation into a VW Beetle house which was completed in 2003. 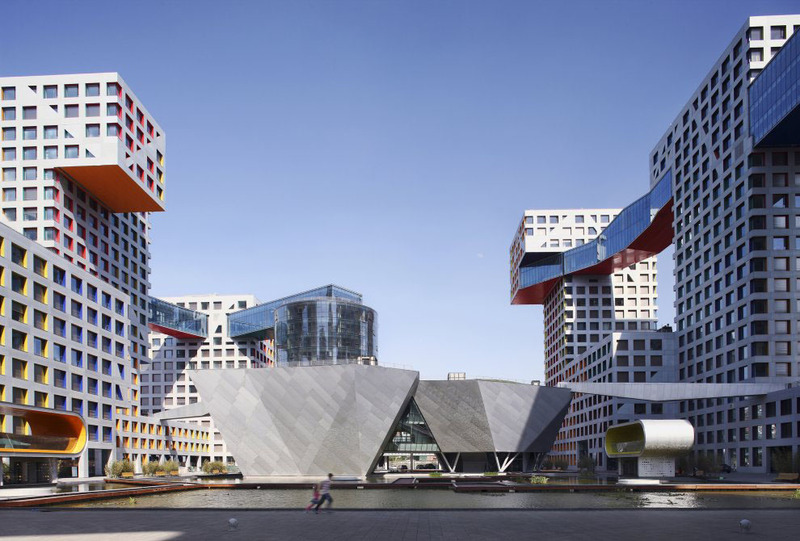 Voglreiter would later build a restaurant and bar “The Car. Das Auto” nearby. The “Auto Residence” is an eco-friendly house with energy efficient heating and insulation technology that reduces energy consumption. The integration between inside and outside is a key theme and function of this tropical house on Sentosa Island, Singapore. Designed by Guz Architects, the Fish House embraces Singapore’s tropical climate by creating an open space that allows interaction between the ocean, the garden, the swimming pool and the house. 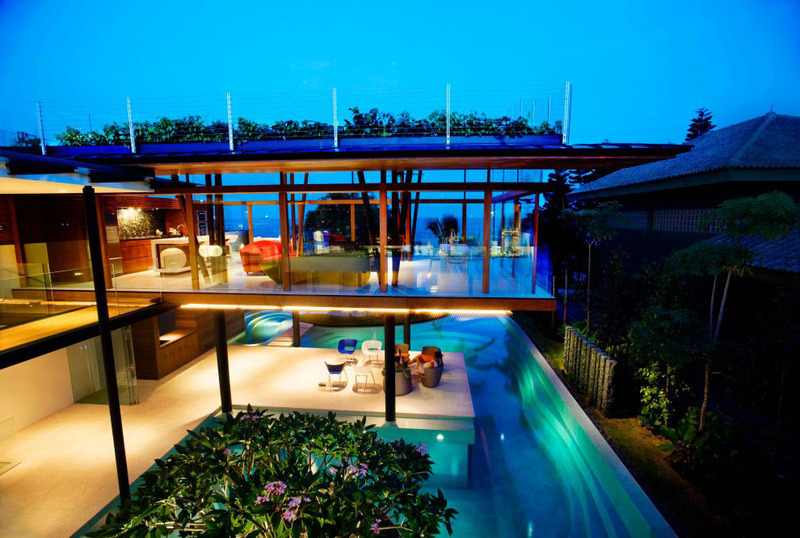 The natural sea breeze ventilates the tropical home, while the curved wavy roofs with solar panels supply energy to the house. This modern home promotes living in harmony with the natural environment. 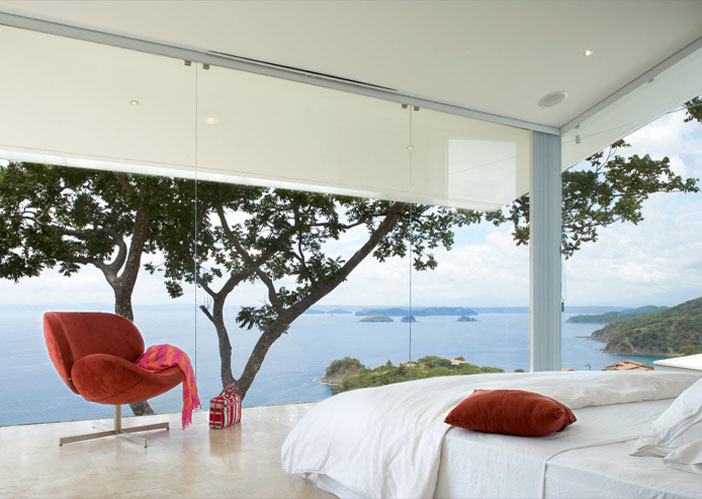 Situated near the village of El Coco in the province of Guanacaste, Costa Rica, this modern house on a dramatic cliff has a spectacular view of the Pacific Ocean and the lush rocky coastline. Designed by Victor Cañas Arquitecto, this 4,500-square-foot vacation home is largely made of glass on the ocean-facing side. Getting through the front door requires crossing a reflecting pool on concrete pavers which serve as the unorthodox “floor” of the foyer. 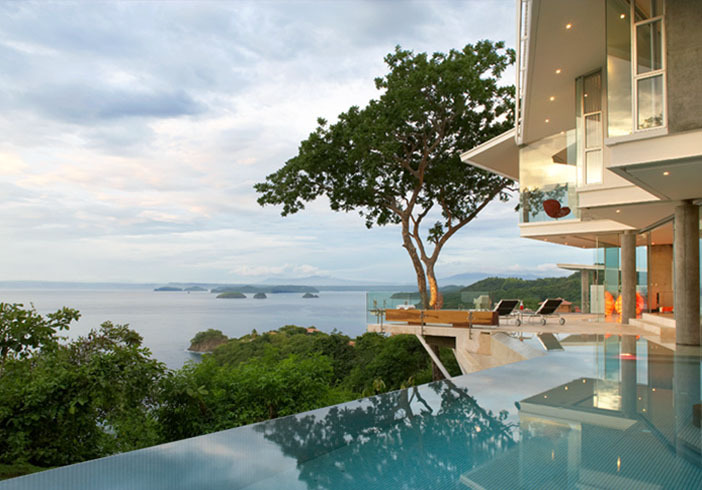 The outdoor infinity-edge swimming pool and tempered-glass panels on the deck maximize the panoramic ocean view. 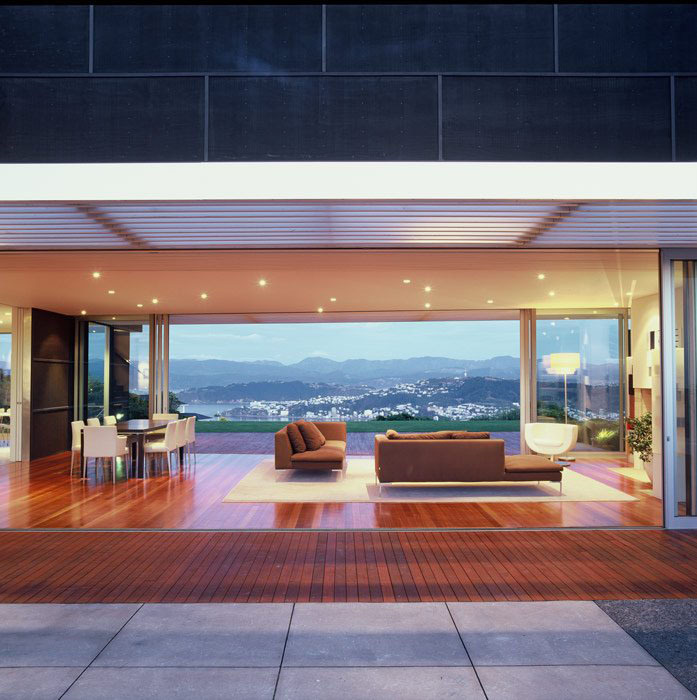 The Northland House is a modern home designed by Parsonson Architects which sits on a high ridgeline overlooking Wellington Harbour in Wellington, New Zealand. Looking east, there is a spectacular view of the harbour and hills beyond. A protective courtyard wall gives the house a lot of privacy from the roadside, while the interior spaces feel very open and connected to the harbour side of the outdoor landscape. 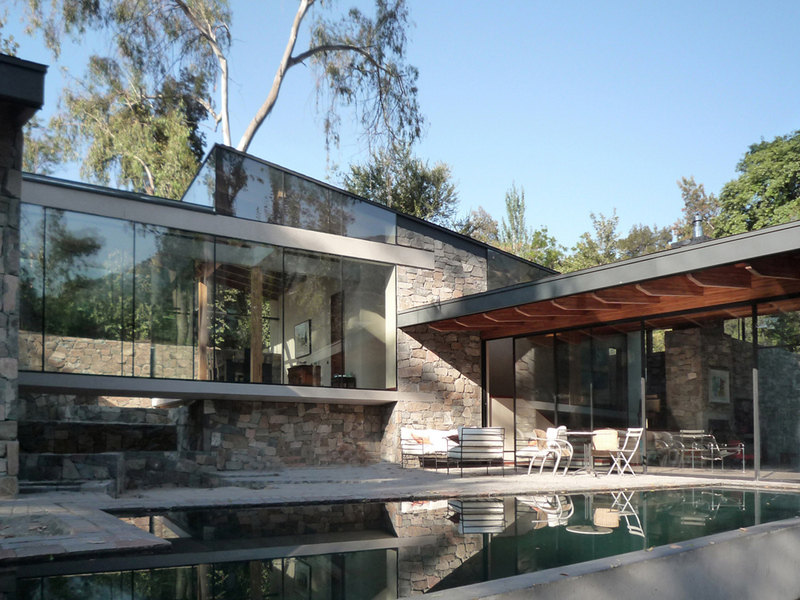 This modern home located in Cerro Lo Curro, Santiago, Chile, and designed by Schmidt Arquitectos Asociados, sits on a gentle slope with a forest of eucalyptus trees. Materials such as stone walls and wood floors are used for the house. The big windows bring the interior and exterior together, creating an open environment for the enjoyment of the natural landscape. The tiered lakes made of stone provide sound and moisture to the air.